Things can get wild in Queensland’s rugged North West. Visit the thriving mining town of Mount Isa, saddle up for the Mount Isa Rodeo, the largest in the Southern Hemisphere, and drop in at the historic Underground Hospital built during WWII. Canoe through vivid red gorges in the Boodjamulla (Lawn Hill) National Park and search for ancient fossils in the limestone outcrops of Riversleigh World Heritage Area. Head to Hughenden to see 'Hughie', the seven-metre Muttaburrasaurus and an impressive fossil collection. And, don’t leave without visiting the Porcupine Gorge National Park. Queensland’s Far West is the place for adventurers. 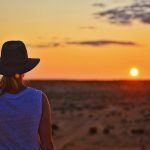 Explore the rugged Simpson Desert by 4WD, see the Big Red sand dune glow at sunset and watch thousands of migratory birds flock to the wetlands of the Diamantina National Park. If you’re looking for outback entertainment, catch a famous Australian band at the Big Red Bash or back a winner at the Birdsville Races. The closest section of Outback Queensland to Brisbane, the South West is home to colourful characters, wedge-tailed eagles and boulder opals. Bathe in mineral-rich mud at the Eulo Mud Baths, meet a tiny endangered marsupial at the Charleville Bilby Experience Centre and peer into the heavens at the Charleville Cosmos Centre. Banana Shire has many natural attractions including gorges, rivers and National Parks such as the Glebe Weir and Expedition National Park. Visit Lake Murphy, Kroombit Tops and Mt. 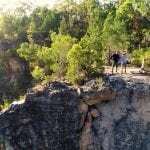 Scoria Conservation Parks, or relax at Isla and Cania Gorges. The Dawson River and Callide Dam provide many opportunities for fishing and water sports. The Shire can also provide many adventures for the 4WD enthusiast.